Learn common Invisalign treatment questions and answers so you can determine if this popular orthodontic treatment option is for you. Our friendly staff at Belmar Orthodontics can offer you excellent patient education to help you make an informed decision. To help you determine if Invisalign treatment is for you, contact our office for a consultation and evaluation. How Invisible Are the Invisalign Aligners? Invisalign treatment is the most invisible orthodontic option on the market right now. For patients that have employment or hobbies that require discretion, Invisalign treatment is the way to go. The Invisalign aligners are made of a clear plastic that is custom-designed to blend in with your smile. This aligner approach allows you to correct your orthodontic issues in a discreet manner. To achieve the best result possible, most patients will need small, tooth colored bumps (called attachments) on several of their teeth. These attachments are the same color as your teeth so they blend in easily. Does Invisalign Treatment Work As Effectively as Traditional Braces? For certain conditions, Invisalign will not be recommended because alternative forms of braces are needed. Your dentist will assess your needs and determine if your oral conditions and goals qualify you for Invisalign treatment. If you are approved as a candidate, you can be assured that your treatment will be just as effective with Invisalign as with braces. Invisalign treatment times are often shorter than treatment with traditional braces, but you still get the same stellar results. Will Invisalign Affect How I Speak? Traditional braces, retainers or Invisalign all have an adjustment period. During this adjustment period you may need to rework how you form certain sounds of letters with an appliance in your mouth. Following this initial adjustment period, most patients report no difficulties with speaking normally. It is not uncommon to have a slight lisp for the first few days as your mouth and tongue adjust to having the aligners in your mouth. The great thing about Invisalign is that the aligners are removable. If you have an important interview or presentation and are concerned about enunciation, you can remove the aligners temporarily. 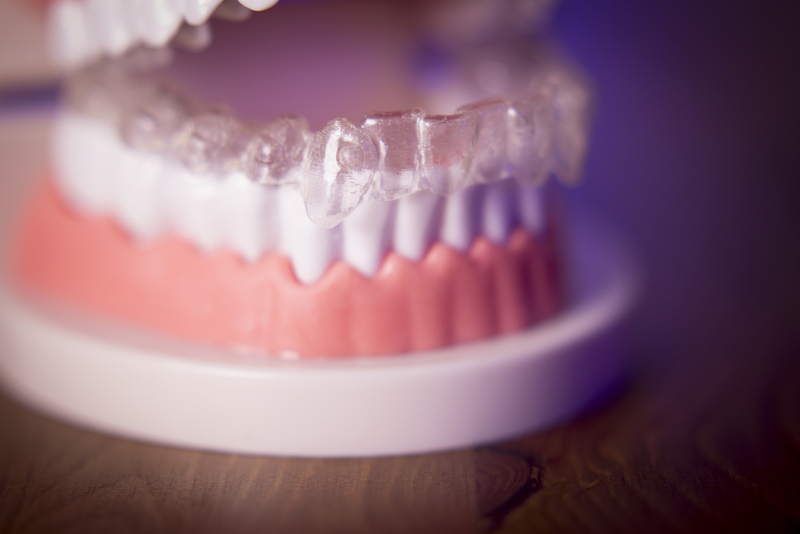 Just remember, aligners need to be worn 20-22 hours per day to do their job! Can I Eat and Drink with My Invisalign Aligners In Place? Eating with the Invisalign aligners in place is not allowed. Food can damage the aligners and disrupt your treatment. As far as drinking goes, Dr. Hardy recommends that patients only drink cold water when the aligners are in place. Occasionally, a patient can drink from a straw when they are drinking anything other than water, but make sure the liquid is cold to prevent distortion of the trays. A member of our Belmar Orthodontics team can talk through any concerns or questions you have about the eating/drinking process with Invisalign. Is Invisalign Treatment More Expensive? The costs for Invisalign® treatment are similar to the costs for traditional wire braces, but the condition of your teeth, the length of the treatment, and the number of aligners your treatment requires to get your teeth and smile where they need to be can impact prices from patient to patient. Dr. Hardy will determine what your Invisalign treatment will cost during your consultation and examination. Check with your dental insurance plan. Invisalign treatment is often covered by dental insurance policies. How Complicated is Invisalign Daily Maintenance? Invisalign® aligners are easily cleaned and maintained by scrubbing them with a toothbrush and water. Alternatively, antibacterial hand soap and a toothbrush can boost your cleaning efforts if needed. Make sure you rinse the aligners (and your toothbrush) well before reinserting the aligners in your mouth. Invisalign also makes an Invisalign Cleaning System that you can purchase from their website. How Soon Will I Achieve My Invisalign Results? Each patient case is different but the average patient will complete his Invisalign treatment within 12 months. If you want to shorten your treatment time, dedicate yourself to wearing your aligners for the prescribed amount of time each day and don’t miss your office appointments. Also, strive to keep your teeth free from tooth decay–which can delay treatment completion dates. The treatment length time for patients using Invisalign Teen®, will be determined by the growth of their permanent teeth.